Black women undertook an energetic and unprecedented engagement with internationalism from the late nineteenth century to the 1970s. In many cases, their work reflected a complex effort to merge internationalism with issues of women's rights and with feminist concerns. 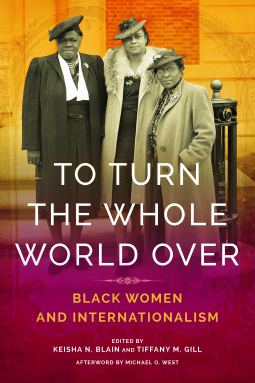 To Turn the Whole World Over examines these and other issues with a collection of cutting-edge essays on black women's internationalism in this pivotal era and beyond. Analyzing the contours of gender within black internationalism, scholars examine the range and complexity of black women's global engagements. At the same time, they focus on these women's remarkable experiences in shaping internationalist movements and dialogues. The essays explore the travels and migrations of black women; the internationalist writings of women from Paris to Chicago to Spain; black women advocating for internationalism through art and performance; and the involvement of black women in politics, activism, and global freedom struggles. Divided into three parts this book is collection of essays focused on the role that African American women have held throughout history in connecting the struggles and triumphs of other nations around the world with Black women in the United States. Each essay focuses on a different time, place and person but so often throughout each, readers can see the interconnected work of the women, and the overlapping work that laid the foundations of movements. Unaware of many of the women and organizations included within this collection, I found this information to be extremely enlightening. The amount of effort these women have put in to further the causes of not just Black women but women and peoples worldwide is extraordinary. Seeing it laid out so succinctly and precisely was at moments overwhelming. How the works of so many of these women has gone unacknowledged for so long is beyond me. Overall these essays serve as a portal to the different times and places of each of these women and organizations that put the well being and advancement of Black women first. Careful analysis of these women and their stories is indeed necessary and with each of these essays there is a comprehensive view of the work that has been done, and the reasons why that work came to an end. I was most intrigued by the earliest attempts to find solidarity with other countries, but also very interested in the work other women had to do to come to terms with their afro heritage. I definitely recommend this collection. It offers a nuanced and yet critical view of the different women, their plan of action and the spaces they created. It takes into account the historical component as well as the social ramification involved with each woman and the actions she took. This book was such an inspirational read! I cannot imagine accomplishing all these women did and on an international level!